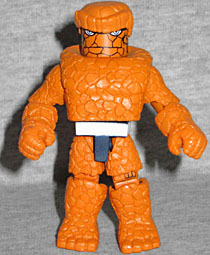 Pilot Ben Grimm first turned into the Thing after being bathed in cosmic radiation, and his skin was transformed into orange rock. He has since reverted to human form several times, but rarely for very long. We've talked about this before, but Jack Kirby didn't draw the Thing with rocky skin: he drew him with hide like a dinosaur. It was the inkers who made Thing rocky, and eventually Jack followed suit. At first glance, this Thing is mostly identical to this Thing - he's got all the same add-on pieces, but not the paint wash to darken them up. Instead of his mouth being open, this one just has a big frown. And if that's all the figure offered, I wouldn't have bought this set. As Rustin revealed, this toy is called "Transformation Thing" because you can remove all his stony extras to reveal a plain Benjy Grimm underneath (well, with the addition of the new head, hands, feet and waist, but you get the idea). To help the Ben Grimm parts blend in with the Thing parts, he's wearing an orange flight suit (which could totally stand in for a prison uniform in a pinch). His name is printed on the right side of the chest, while the left side and his left shoulder have patches featuring a rocket logo. His suit is unzipped partially, allowing us to catch a glimpse of the black shirt he's wearing beneath it, and there's a single pocket on the front of his left leg, just above the knee. Norrin Radd originally became the Silver Surfer to steer the Galactus away from his homeworld of Zenn-La. He still occasionally fills this role, seeking unpopulated planets for his master to consume. 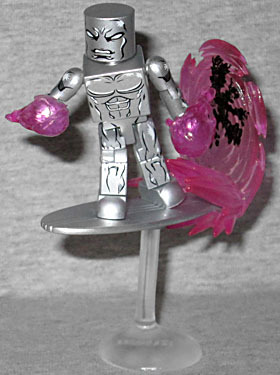 Herald Silver Surfer is not quite as "busy" a design as Cosmic Silver Surfer was, which is nice. He's very detailed, but it doesn't go overboard. His surfboard is the same as that figure, but this time he gets a neat new piece to fit on the end. It's a portal in space, made from wavy translucent purple plastic with a jagged edge and some black Kirby dots in the center. He gets new energy effects for his hands done in the same color. I'm not sure how Art Asylum decided that "the Power Cosmic = purple," since it's generally been shown as a lot of different colors in the comics, but it does contrast very nicely. Marvel Minimates TRU Series 15 is another series where all the figures were exclusives, but only half of them were marked, which is frustrating. On the other hand, all the sets were also intended to complete or complement existing releases, which is fun: in this case, Transformation Thing and Herald Silver Surfer go along with Series 48.